A Journal for MultiMedia History feature article. "The 1939 Dairy Farmers Union Milk Strike in Heuvelton and Canton, New York: the Story in Words and Pictures." Although strikes in the New Deal era are usually associated with organized labor, farm strikes or "holidays" also played an important role in shaping New Deal politics. By 1931, a large and angry agrarian insurgency had emerged in the Plains states. The largest and most infamous farm strike organization was Milo Reno's Farmers' Holiday Association. This group of prosperous and usually quiescent Corn Belt farmers pressured the Roosevelt administration to address the escalating crisis in the Farm Belt with a series of "holidays" or farm strikes in 1933. What is perhaps less well-known is that dairy farmers were the driving force behind the early farm holiday movement. There were "milk wars" in St. Louis and central Illinois in 1931, and "holidays" in the Houston, Sioux Falls, Atlanta, Chicago, and Indiana milk markets in 1932. The largest Midwestern milk strike was the Sioux City Milk War of 1932, which served as a catalyst for the Farmers' Holiday strikes. The issue that sparked this conflict was the "spread" between retail and farm milk prices in Sioux City, Iowa. Dairy farmers received just two cents per quart from local processors, while consumers paid eight cents per quart in Sioux City. The Sioux City Milk Producer's Associationwhose membership overlapped with the Farmers' Holiday Associationcalled the strike, which was settled only after violence and mass arrests. At one point three thousand farmers marched on the jail at Council Bluffs, Iowa, forcing the local sheriff to release their fellow strikers. In New York State, the Depression hit dairy farmers equally hard. Dairy producers reeled under the combined effects of the same forces that had produced the Midwestern strikes: decreased demand for milk and low farm milk prices. Like their Midwestern counterparts, with technological advances New York dairy farmers had greatly increased their capacity to produce milk. Further, a wave of retail price cutting swept through the New York City milk market in the early 1930s, which had a negative impact on both farmers and milk dealers. As a result of this cutthroat competition, market relations nearly collapsed; according to the New York State Department of Agriculture's annual report, "At the close of 1931 prices paid to producers were lower than in many years." In 1933, the New York State Legislature convened a special investigative committee, named after Watertown state Sen. Perley Pitcher, to study the consequences of the collapse in milk prices. The Pitcher Committee quickly identified the immediate problem: farm milk prices had fallen well below the farmers' cost of production. For example, the average price paid for one hundred pounds of milk (hereafter abbreviated cwt) with a 3.5% butterfat content reached ninety-nine cents in April, 1933. In January, 1931, farmers had received $2.25 for the same amount of milk. As a result, according to the New York State Milk Control Board: "Prices paid for milk had fallen to such a low level that dairymen could not possibly meet their most pressing obligations. Even the bare necessities of life could not be secured by many farm families, and many dairymen were threatened with the loss of the farms and homes in which their meager lifetime savings were invested." The Pitcher Committee report identified a number of causes for the low milk prices paid to farmers. First, there was the national decline in prices associated with the Depression. Second, New York dairy farmers were more productive, having increased both the number of cows and pounds of milk produced. Third, the farmers' transportation and distribution costs had not declined in proportion to the reduction in milk prices. Fourth, and perhaps most importantly, the report cited the destructive trade practices among milk dealersin particular the dealers' recurring practice of cutting retail prices in the lucrative New York City milk market. 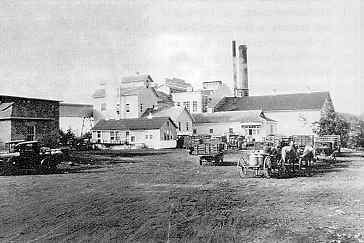 Sheffield Farms in the 1920s. In the 1930s, three powerful corporations, the United States Dairy Products Company, Borden's Condensed Milk Company, and Sheffield Farms Milk Company, handled two-thirds of the fluid milk sold in New York City. Because these firms dominated the New York metropolitan market, they had to carry excess fluid milk capacity, called surplus milk, in order to satisfy demand during the fall and winter when farmers produced less milk. The dilemma for the "Big Three," as they were known, was to keep retail milk prices high enough to pay for this excess fluid capacity. Smaller dealers, in contrast, carried no surplus and thus could afford to cut prices below that of the large dealers. While retail price cutting often offered the small milk handlers a competitive advantage, the practice of cutting prices locked them into an ongoing price war with the Big Three. As a 1934 Milk Control Board report concluded: "Price cutting by milk dealers [in New York City] had reduced, and in some cases destroyed, [the milk dealer's] income." Sheffield Farms in the late 1930s. Membership in these organizations offered farmers the advantage of guaranteed markets, as well as a method of balancing the price disparities between fluid (drinking) milk and lower priced manufacturing grade milk which was used in the production of cheese and butter. Left outside of this system, however, were the ten thousand or so "independents" or farmers who supplied the many smaller dealers and cheese factories across New York State. Lacking the market stability offered by large co-ops such as the league, the independents suffered greatly when both prices and demand fell sharply in the early 1930s. Not surprisingly, many independents expressed great dissatisfaction with the close relations between the large dealers and their co-op allies. Many independents, for example, considered the league and the Sheffield Producers Cooperative Association to be nothing more than company unions for Borden's and Sheffield Farms, respectively. In 1933, a large group of independents and farmers who decided not to renew their league contracts organized a milk strike movement in western and central New York. In April, the strike movement was led by Albert Woodhead and the Western New York Milk Producers Association, who pushed for state interventionin the form of price controlsin a four-day strike against league plants near Rochester. In August, Woodhead's organization was joined in a second strike by a group of independents organized by Felix and Stanley Piseck of Newport, New York. The August milk strike, ironically, was a protest against the Milk Control Board which had been created by the state legislature during the April milk strike. By August, however, the independents' view of the Milk Control Board had soured. Farmers charged that the board's price fixing had favored the league and Sheffield Producers Cooperative Association. The larger problem with the 1933 milk strikes was that they quickly spread beyond the control of the groups that organized them, and, as with the farm strikes in the Midwest, had acquired a reputation more for violence and destruction than for constructive political accomplishments. As a New York Times reporter concluded, the 1933 strikes "possibly. . . brought New York State closer to marshall law than at any time since the Revolutionary War." 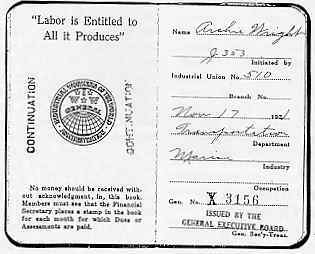 Archie Wright's 1921 IWW membership book. DFU Collection, St. Lawrence University. In 1936, following two years of relative calm in the New York milkshed, upstate farmers again threatened to strike. On September 29, Stanley Piseck traveled to Canton, New York, to rally support for yet another strike after farm milk prices hit their lowest level in fifteen years. When local strike leaders failed to appear, Piseck postponed the strike one month. In the meantime, the five hundred farmers in attendance elected a five-member committee to consider the prospect of a new organization which would represent northern New York's angry independents. This new organization would quickly eclipse the Piseck Brothers' strike movement. One of the five farmers on this committee was Archie Wright, a former organizer for the Industrial Workers of the World (IWW), who had returned to his father's thirty-nine cow dairy farm in Heuvelton, New York, a few years earlier. Drawing upon his considerable experience as an IWW organizer, on October 15 Wright announced the formation of the Dairy Farmers Union (DFU) at the Town Hall in Canton, New York. Archie Wright's analysis of the dairy industry was a mixture of Marx and Jefferson, with a bit of the Populist movement thrown in. He was an early and passionate defender of what today is called "family farm" agriculture. According to Wright, the small farm was the foundation of American democracy because it was the repository of broad-based political representation and economic power. In a union pamphlet, he wrote: "Our government, reflecting small farm, small business ownership was set up as a democracy that attracted worldwide attention and no small amount of envy. [Yet] suppose this situation should change. Suppose all of our rural counties were in one or two, or even ten farms. What would happen to our town meetings and town government . . . [which] are the backbone of our democratic form of government, both national and state. Fascism, [or] monopoly business dictatorship, is not inevitable as long as these town and county governments can be preserved." In New York, however, the problem was that small dairy farmers were not represented in their own industry, nor for that matter in electoral politics. Instead, an "interlocking directorate of farm organizations, politicians, publishers, alleged co-ops, and Cornell University" ruled the dairy industry in the interests of the milk dealers. This milk trust operated on the principle of "[t]he working farmer be damned." A further problem was that the DFU's main constituency of small, independent dairy producers possessed few tangible resources upon which to build an effective organization. Unlike New York's larger and more prosperous dairy farmers, the typical small producer had little money or time to devote to politics, and lacked the communication skills and political connections that were effective in local- or state-level politics. Nonetheless, these same small farmers possessed, in Wright's view, certain intangible resources which, if organized correctly, could make for a powerful movement. Since dairy farming was the dominant "industry" in much of rural upstate New York, dairy farmers enjoyed the support of their local communities. Moreover, Wright was well aware of a long tradition of direct action protests (milk strikes) by small farmers in New York State. Beginning in 1883 with the Orange County Milk War, Empire State dairy farmers had often resorted to strikes against the New York milk dealers when they believed they were not receiving a fair price for their milk. In the 1930s, farmers had obviously demonstrated a similar sense of shared exploitation. Blending his own syndicalist orientation with the farmers' penchant for direct action, Wright envisioned the DFU as "a strong, militant Union of enlightened farmers" who would use their control over milk productionand the threat of disrupting the dairy industryas a way to gain greater political and economic power. As he explained in a union newsletter: "Farm organizations don't make a milk strike. A milk strike is something like an earthquake. You can't even set the day. The farmers are the people who make a milk strike." The key for Wright was to effectively harness the energy of farmers' discontent and channel it into a more effective political force. This meant that the violence and destruction which had occurred during previous milk strikes had to be avoided, primarily because it had such a detrimental effect on public opinion. Therefore, one of Wright's goals for the DFU was careful supervision of Union picketing. He wrote: "A milk strike without organization and preparation is just a blind rebellion. Organization puts the milk strike on a business basis. It provides leadership, experience, program . . . Farm organization is work, day in day out, week in week out, To live, you have to think." 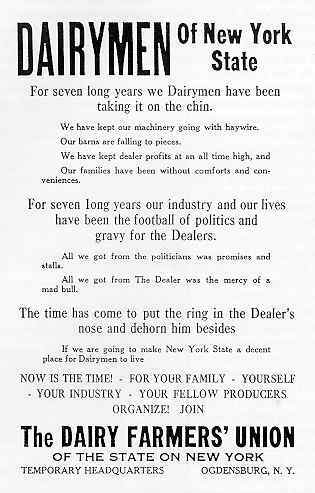 Dairy Farmers Union organizing poster, c. 1936-37. A related goal was to cultivate public opinion that was sympathetic to the union's cause. Wright wrote, "One of the first things an organization has to do when farmers get ready to strike is to muster all possible public support on the farm side." He pioneered the use of radio as an organizing tool, giving daily strike updates on WFBL in Syracuse. In another example, during one DFU strike the union leadership decided not to withhold milk from Dairymen's League milk plants in Clinton County because the plants supplied fifty-two thousand soldiers on Army summer maneuvers. In doing so, Wright was careful to avoid the charge that the union had obstructed the war effort. Because of this strategy the Clinton County DFU secretary-treasurer could write that, "Public sentiment was largely with the union throughout the strike." Wright also made arrangements to distribute free milk to New York City orphanages and hospitals duringuUnion milk strikes labeled "Compliments of the DFU." The DFU's organizational structure offered farmers an alternative to the dominant co-ops in the milkshed. Emphasizing decentralized control and decision making, the DFU constitution required that a simple majority of members ratify all important union business at the DFU's annual general convention. The only exception to this rule was the vote on milk strikes, which required a much higher eighty percent majority. The DFU agenda was set by its membership at the county level, and the organization was directed by a board of county chairmen. 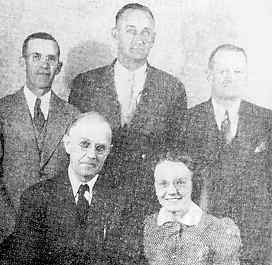 In the main office in Ogdensburg, New York, a chairman (Wright) and general secretary-treasurer conducted the day-to-day union business. Although not specifically mentioned, women were eligible and sometimes served as DFU officers. The only individuals specifically prohibited from holding DFU office were those employed at "any milk cooperative association having . . . more than one [milk] plant at the time of [their] employment." In July 1937, the DFU faced an opportunity to test Wright's strategy when Sheffield Farms announced it would close twelve fluid milk plants located in St. Lawrence, Franklin, and Clinton counties. The twelve plants would then be reopened after August 1 as manufacturing plants, paying farmers the corresponding lower price for Class II or manufacturing grade milk. Faced with the loss of their more profitable fluid market, the DFU immediately began preparations to strike the twelve Sheffield plants. On July 31, following unsuccessful negotiations with representatives from Sheffield Farms and the New York Department of Agriculture, hundreds of DFU members "jammed" the Canton Town Hall "to the doors" in what the St. Lawrence CountyPlaindealer called "the largest farmers meeting ever held in this village." After three hours of deliberation DFU farmers voted unanimously to strike. 1939-40 St. Lawrence County DFU Committee. From the outset, it was clear that this strike would be conducted much differently than previous strikes in New York State or the upper Midwest. The DFU first sought to avoid dumping its members' milk; instead, it was diverted to other processing facilities. For example, the union brought in one hundred cream separators which were distributed throughout the strike area. The cream was then shipped to the Fairmont Creamery in Buffalo. The DFU leadership also carefully monitored union strike activity. A tri-county strike committee supervised picketing at the twelve Sheffield plants, composed of one delegate from each county together with Carlton Adams, committee chair, and Elizabeth Shonyo, treasurer. Archie Wright issued daily strike bulletins and handled publicity. In his first bulletin, he set the tone for the strike: "No violence and no destruction of property." The result was peaceful and effective picketing, especially given the number of farmers involved. 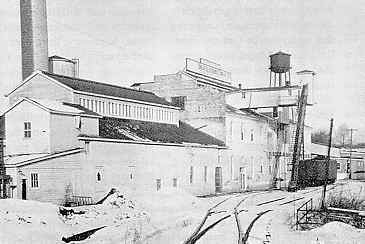 At the Canton, New York, Sheffield Farms plant, which was at the time the largest fluid milk receiving plant in the world, the DFU "dried up" the flow of milk with a minimum of disturbances and kept the plant closed for 108 consecutive days. The union had similar success at the other twelve Sheffield plants. In Ellenberg, the DFU employed tactics drawn from the Congress of Industrial Organizations' (C.I.O. 's) recent successes in rubber and auto strikes. Encouraging farmers to use "passive resistance," Wright called for a sit-down strike by men, women, and children on the road leading to the Sheffield Farms plant. In the second strike bulletin Wright noted: "This is the first strike in the dairy industry which has not been accompanied by widespread violence and destruction of property. It is also the first strike called by actual vote of the producers affected and to enforce demands formulated by themselves." Importantly, the union's change in tactics did not go unnoticed in local communities. Williston Manley, editor of the St. Lawrence County Plaindealer, and a persistent critic of previous milk strikes, wrote: "I wonder if we realize that something very revolutionary has taken place up here without any revolution. Of course, I am writing about this milk strike . . . the union did something unexpected, unexpected I know to citizens generally, and I imagine unexpected by Sheffield Farms. The union staged a one hundred percent effective strike, staged it without bloodshed, without tumult . . . It had the machinery all set up." On October 29, Wright expanded the strike into a statewide boycott against the Big Three milk dealers, with little effect on the New York City milk supply. Where the DFU found greater success was in negotiating contracts with smaller dealers across upstate New York. These contracts typically included DFU recognition and a provision for the milk companies to collect DFU dues, as many industries did for industrial unions. On November 2, the DFU announced a settlement with seven upstate dealers representing milk plants in eight counties. Two weeks later, Wright and the DFU leadership recommended that the strike be voted off, since farmers were now receiving higher prices from many of the smaller milk dealers. In retrospect, the 1937 DFU strike achieved mixed results. One important lesson gained by Union members was that given sufficient organization and planning, milk strikes could be an effective weapon. However, even though the DFU had increased its membership and gained important support in local communities, it lacked the scope and power to challenge the Big Three. Sheffield Farms, for example, had increased milk prices during the strike but refused to recognize the DFU. Thus the DFU's goals in 1938 were to organize new county chapters and recruit new members. By June 1939, DFU membership reached fourteen thousand farmers across the milkshed. The Story in Words and Pictures Copyright © 1998 by the Journal for MultiMedia History.